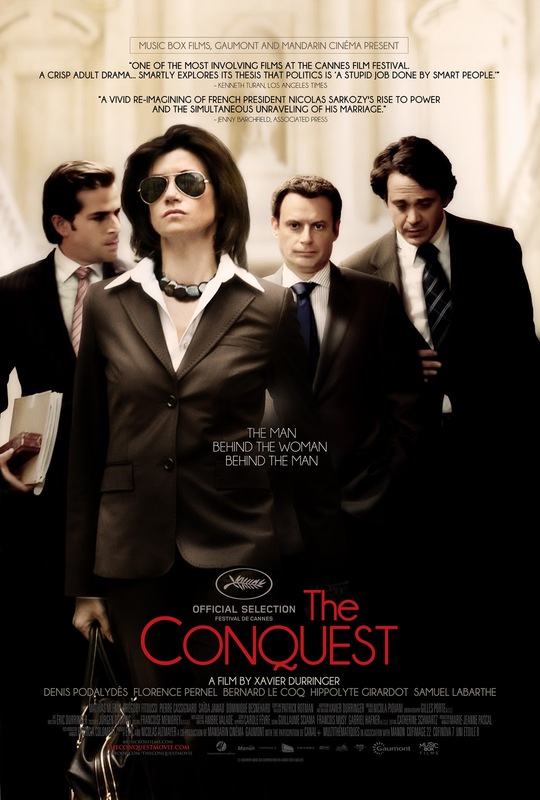 The most remarkable thing about THE CONQUEST, directed by Xavier Durringer, is that it is a biography of a sitting president, France's Nicolas Sarkozy. You can get a sense of its potential impact by imagining a movie that takes you behind the scenes of the election of Barack Obama, revealing the president's personal flaws, foibles and temper tantrums. Unfortunately, THE CONQUEST offers very little, dramatically speaking. The film is composed chiefly of prosaic scenes in which political allies, advisers and rivals meet in handsomely appointed rooms and talk, talk, talk. There's enough low-level, uninteresting murmuring in this movie to lull the viewer into a pleasant sieste. Sarkozy's quest for the presidency is jeopardized when his wife, Cécelia (Florence Pernel), who is also his closest political advisor, leaves him for the campaign's publicist. Sarkozy spends much of the movie begging Cécelia, by cell phone, to come back, if only to offset negative publicity, including a photo in Le Monde of her vacationing with her new amour. Sarkozy's free-market, pro-American message and ability, at the same time, to persuade factory workers that he's the “cost-of-living candidate,” win him the presidency in 2007, but at what cost? Even his own wife is unwilling to show up at the voting booth for him. A rival remarks, “He can't hold onto his wife; how can he hold onto France?” Then again, this is France, and the French aren't that easily scandalized. Ironically, Sarkozy's campaign slogan is “Ensemble tout devient possible” – together, everything becomes possible. The film's time period does not cover Sarkozy's subsequent divorce (his second) and marriage to the beautiful Italian-French model-singer Carla Bruni. The film's cast bear remarkable physical resemblances to the people they portray, and the film has its juicy moments (including a shoving match between Sarkozy and Cécelia). But the writing and direction are dully workmanlike, and the story rarely peers beneath the surface of events, revealing little except that “Sarko” is ambitious, petulant and favors chocolate pralines with hazelnuts. (Interestingly, although Sarkozy is considered staunchly pro-American, he opposed the invasion of Iraq.) French audiences, more familiar with recent political scandals and events, would likely derive greater enjoyment from the film. One of the pithiest capsule reviews in Halliwell's Film Guide, about a now-forgotten rural comedy, reads: “Of limited interest to non-hillbillies” Similarly, THE CONQUEST could be said to be “of limited interest to non-French people.” 2 out of 4 stars.